Endosomal TLRs play an important role in systemic autoimmune diseases, such as systemic erythematosus lupus, in which DNA- and RNA-associated autoantigens activate autoreactive B cells through TLR9- and TLR7-dependent pathways. Nevertheless, TLR9-deficient autoimmune-prone mice develop more severe clinical disease, whereas TLR7-deficient and TLR7/9–double deficient autoimmune-prone mice develop less severe disease. To determine whether the regulatory activity of TLR9 is B cell intrinsic, we directly compared the functional properties of autoantigen-activated wild-type, TLR9-deficient, and TLR7-deficient B cells in an experimental system in which proliferation depends on BCR/TLR coengagement. In vitro, TLR9-deficient cells are less dependent on survival factors for a sustained proliferative response than are either wild-type or TLR7-deficient cells. The TLR9-deficient cells also preferentially differentiate toward the plasma cell lineage, as indicated by expression of CD138, sustained expression of IRF4, and other molecular markers of plasma cells. In vivo, autoantigen-activated TLR9-deficient cells give rise to greater numbers of autoantibody-producing cells. Our results identify distinct roles for TLR7 and TLR9 in the differentiation of autoreactive B cells that explain the capacity of TLR9 to limit, as well as TLR7 to promote, the clinical features of systemic erythematosus lupus. Many of the autoantigens targeted during systemic autoimmune diseases act as autoadjuvants by associating with macromolecular complexes that stimulate innate immune receptors. In B cells, nucleic acid–associated autoantigens need to be bound by the BCR and transported to a TLR-associated compartment where TLR detection of DNA or RNA provides a second signal that promotes B cell activation. This paradigm, whereby BCR-delivered TLR agonists promote autoreactive B cell activation, initially emerged from in vitro studies (1) and has been supported by numerous in vivo observations. Thus, TLR7-deficient autoimmune-prone mice fail to make autoantibodies reactive with RNA-associated autoantigens, and TLR9-deficient autoimmune-prone mice fail to make autoantibodies reactive with dsDNA or chromatin (2). Moreover, autoimmune-prone mice lacking only TLR7 have markedly attenuated disease (2), whereas overexpression of TLR7 results in exacerbated clinical symptoms and accelerated mortality (3, 4). However, quite paradoxically, autoimmune-prone mice that lack functional TLR9 invariably develop more severe clinical disease and have shortened lifespans (5–9). Remarkably little is known about the differential outcomes of TLR7 versus TLR9 engagement or how TLR9, but not TLR7, mitigates systemic autoimmunity. In mice, both TLR7 and TLR9 are expressed by B cells, dendritic cells (DCs), macrophages, and even neutrophils; therefore, any of these cell types could negatively regulate disease onset through a TLR9-dependent mechanism. However, the growing appreciation that B cells play a pivotal role in the etiology of systemic autoimmune diseases (10, 11) led us to monitor the direct effects of BCR/TLR7 and BCR/TLR9 coengagement on B cell differentiation. We used BALB/c mice expressing an IgG2a-specific site-directed transgene-encoded receptor, AM14, derived from an ∼6-mo-old Fas-deficient MRL/lpr mouse (12–14). These rheumatoid factor (RF) B cells bind IgG2a with sufficiently low affinity that they survive tolerance checkpoints and persist in BALB/c mice as resting naive follicular (FO) B cells, even in the presence of (monomeric) serum IgG2a (15). In fact, only IgG2a immune complexes (ICs) that incorporate endogenous nucleic acids capable of engaging either TLR7 or TLR9 can induce these RF B cells to proliferate in vitro (16). RF B cell responses to DNA-associated ICs are TLR9 dependent and inhibited by the addition of DNase I to the culture medium, whereas responses to RNA-associated ICs are TLR7 dependent and inhibited by the addition of RNase to the culture medium (1, 17). Stimulatory ICs include defined ligands, such as IgG2a-bound CG-rich dsDNA fragments (16, 18), as well as IgG2a autoantibodies that bind cell debris or surface-bound autoantigens, which are present in the primary B cell cultures (1, 17). The availability of autoantibodies reactive with DNA and/or RNA-associated autoantigens, together with TLR-deficient RF B cells, make it possible to directly compare the downstream effects of BCR/TLR7 and BCR/TLR9 engagement. We found that in vitro activation of RF B cells, through a mechanism dependent on the BCR and TLR7, promotes the extended survival of RF B cells and their differentiation into CD138+ plasmablasts. BCR/TLR7- and BCR/TLR9-activation pathways also have distinct functional outcomes in vivo, where again RF B cells activated through the BCR/TLR7 pathway, but not the BCR/TLR9 pathway, preferentially differentiate into Ab-producing cells. AM14, AM14 Tlr9−/−, and AM14 Tlr7−/− mice were described previously (13, 15, 19, 20). FcγR2b-deficient BALB/c mice and CD45.1 BALB/c mice were obtained from The Jackson Laboratory. AM14 Tlr9−/− and AM14 Tlr7−/− mice were intercrossed to generate AM14 TLR7/9 double-knockout mice (Tlr7−/−Tlr9−/−). All mice were bred and maintained at the Department of Animal Medicine of the University of Massachusetts Medical School in accordance with the regulations of the American Association for the Accreditation of Laboratory Animal Care. Splenic B cells were positively selected and cultured in RPMI 1640/5% heat-inactivated FCS, as described previously (15), with the following ligands—1 μg/ml CpG 1826 (s-oligodeoxynucleotide[ODN], kindly provided by Idera Pharmaceuticals), 0.1–1.0 μg/ml CL097 (InvivoGen), and 15 μg/ml goat anti-mouse IgM F(ab′)2 (Jackson ImmunoResearch)—or with the mAbs PL2-3 (1 μg/ml), PA4 (0.3 μg/ml), and BWR4 (10 μg/ml) (21–23). The ligands recognized by the mAbs are derived from cell debris generated in culture; therefore, the monoclonal autoantibodies spontaneously form ICs. Better-defined ICs were formed by combining a biotinylated CG-rich dsDNA fragment (18) with streptavidin (SA) and an IgG2a anti-SA mAb, at a final concentration of 0.5 μg/ml DNA, 0.13 μg/ml SA, and 0.5 μg/ml anti-SA mAb. In certain experiments, the BWR4 cultures were supplemented with IFN-β (300 U/ml; PBL). B cell proliferation was assessed by [3H]thymidine incorporation at the times indicated or by fluorescent dye dilution at 72 h. B lymphocyte stimulator (BLyS), provided by Human Genome Sciences, was added to selected experimental groups maintained for 72 h at a final concentration of 50 ng/ml. The TLR9 inhibitory ODN (3′-CCT GGA TGG GAA CTT ACC GCT GCA-5′) was described previously (24). B cell subsets were identified with CD22.2-FITC, CD138-PE, CD45.2-PE, CD45.1-allophycocyanin (BD Biosciences), CD45R/B220–eFluor 450, and CD44–eFluor 780 (eBioscience). RF B cells were detected with biotinylated-4G7 in combination with SA–PerCP–Cy5.5. IRF-4 was detected using an IRF-4 Ab (clone M-17; Santa Cruz Biotechnology) and anti-goat IgG Alexa Fluor 647 (Jackson ImmunoResearch). IRF4-PE and IRF8–PerCP–eFluor 710 (eBioscience) were used to costain IRF8 and IRF4. B cell proliferation was assessed by CFSE dilution (Life Technologies) (15) or VPD450 dilution (BD). Dead cells were distinguished with TO-PRO-3 (Life Technologies). To analyze TLR7 expression levels, unstimulated purified B cells or B cells stimulated for 24 h were fixed and permeabilized using the Foxp3 Fix/Perm Kit (eBioscience). TLR7 protein was detected using a biotinylated mouse TLR7-specific mAb, A94 (25), in combination with SA-PE. Flow cytometric analysis was carried out using a BD LSR II with Diva Software (BD), and analysis was conducted with FlowJo software (TreeStar). Total RNA was extracted using the RNeasy Mini Kit (QIAGEN). Reverse-transcribed DNA (Quanta) was analyzed by quantitative real-time PCR (qPCR) using TaqMan probes for bcl-6, pax5, and prdm1 (Life Technologies). Samples were normalized to GAPDH and analyzed using the ΔΔCT method. For microarrays, RNA was prepared by the TRIzol method (Invitrogen), purified using RNeasy Mini columns (QIAGEN), and used on Agilent mouse 6x80K arrays with a control pool of B cell RNAs from all genotypes (unstimulated), which served as a reference (Cy3) for each genotype’s sample over a time course of stimulation with PL2-3 (Cy5). The Cy5/Cy3 ratio of gene expression was captured and normalized to the ratio values of the wild-type (WT) at 0 h (unstimulated) array. Gene expression data were submitted to the National Center for Biotechnology Information Gene Expression Omnibus database under accession number GSE58756 (http://www.ncbi.nlm.nih.gov/geo/query/acc.cgi?acc=GSE58756). Ab-forming cells (AFCs) were measured by ELISPOT assay. Filter plates (Millipore) were coated with Abs specific for mouse IgG2a (SouthernBiotech) and IgG1 (Jackson ImmunoResearch). Bound Ab was detected with biotinylated anti-clonotype 4G7 (for IgG1) or 4-44 (for IgG2a), as well as SA–alkaline phosphatase (BD Biosciences) (12). Spots were developed with BCIP/NBT substrate (Sigma-Aldrich) and counted using an ImmunoSpot reader (C.T.L.). B220-purified splenic B cells (15 × 106) were injected i.v. into CD45.1 BALB/c mice on day 0, together with 50 μg PL2-3. Mice received additional i.v. injections of PL2-3 on day 3 or on days 3, 7, and 10. Spleens were harvested on day 6 or 13. To assess proliferation, purified B cells were labeled with 3.5 μM VPD450 (BD) for 5 min prior to injection. Statistical analyses were conducted with GraphPad Prism6 software. Comparisons between two groups were performed with a Student t test for normally distributed data. Two-way ANOVA, including the Bonferroni posttest or the Tukey multiple-comparison test, was used for multiple-group comparisons. A p value < 0.05 was considered significant. The monoclonal autoantibodies PL2-3, PA4, and BWR4 were reported to recognize chromatin, DNA, and RNA, respectively (21–23), and to activate RF B cells in vitro through TLR-dependent mechanisms. WT, TLR7-deficient (Tlr7−/−), TLR9-deficient (Tlr9−/−), and TLR7/9 double-deficient (Tlr7−/−Tlr9−/−) RF B cells were stimulated with the monoclonal autoantibodies, and the responses were compared with small molecule ligands for TLR9 (CpG ODN 1826) and TLR7 (CL097). Proliferation was determined by [3H]thymidine incorporation (Fig. 1A, left panel). The PA4 response was entirely TLR9 dependent because only TLR9-sufficient cells could respond. Tlr7−/− and Tlr7−/−Tlr9−/− B cells mounted comparably low responses to BWR4 compared with WT B cells, indicating a critical role for TLR7, but not TLR9, in this response. In contrast, Tlr7−/− and Tlr9−/− cells responded to PL2-3 significantly better than did Tlr7−/−Tlr9−/− cells; the relatively modest response of the Tlr9−/− population was further increased at day 2 (Fig. 1A, right panel). Therefore, the PA4 response is TLR9 dependent, the BWR4 response is TLR7 dependent, and the PL2-3 response can be driven by both TLR9 and TLR7. These data suggest that PL2-3 binds autoantigen-associated complexes that incorporate both DNA and RNA. Monoclonal autoantibodies activate RF B cells through BCR/TLR9-dependent, BCR/TLR7-dependent, or both BCR/TLR7- and BCR/TLR9-dependent pathways. (A) Splenic B cells from RF WT, Tlr7−/−, Tlr9−/−, and Tlr7−/−Tlr9−/− mice were activated with the indicated ligands or monoclonal autoantibodies for 30 h (left panel) or 40 h (right panel) and proliferation was measured by [3H]thymidine uptake. Data represent the mean ± SEM of three independent experiments. 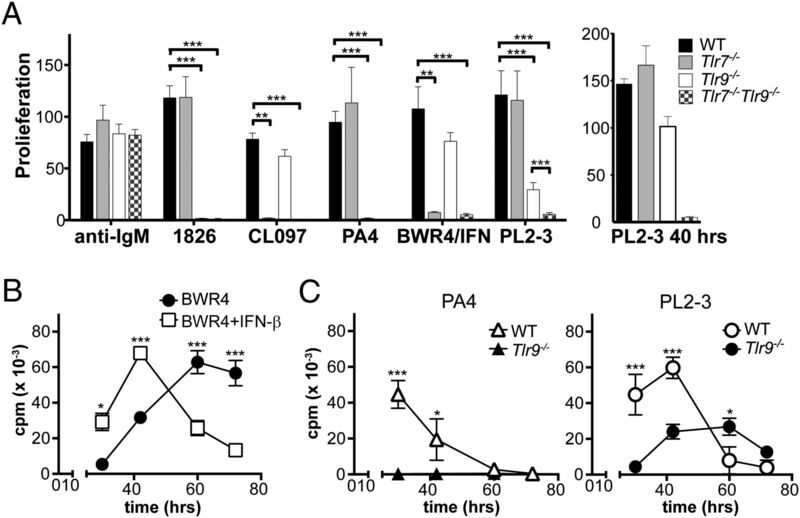 (B) RF WT B cells were stimulated with BWR4 in the presence (□) or absence (●) of IFN-β for the indicated times. (C) RF WT and RF Tlr9−/− B cells were stimulated with PA4 (left panel) or PL2-3 (right panel) for the indicated times. Data in (B) and (C) are representative of three independent experiments. Proliferation was assessed by [3H]thymidine incorporation over the last 6 h of the experiment. *p ≤ 0.05, **p ≤ 0.005, ***p ≤ 0.0005, unpaired Student t test. We showed previously that type I IFN markedly enhanced the initial response of RF B cells to BWR4, as detected 30 h after the addition of ligand (17). Based on the somewhat delayed PL2-3 response of Tlr9−/− cells, we also decided to monitor the PA4 and BWR4 responses over a more extended time period. In the absence of type I IFN, the BWR4-stimulated WT B cells responded well at later time points (Fig. 1B). Notably, the TLR7-driven component of the PL2-3 response (Tlr9−/− cells) recapitulated the BWR4 kinetics, whereas the TLR9-driven PL2-3 and PA4 responses peaked and declined at an earlier time point (Fig. 1C). Together, these data indicate that BCR/TLR7 coengagement promotes a slightly delayed, but more sustained response, than does BCR/TLR9 coengagement. The delay may be due, at least in part, to a TLR7-dependent induction of type I IFN and subsequent upregulation of TLR7 expression (19). Further studies were performed without the addition of type I IFNs. To more precisely monitor both proliferation and death, RF WT B cells were labeled with CFSE and stimulated with the same set of ligands for 72 h. Cell division was assessed by CFSE dilution, and dead cells were identified with the cell permeable DNA stain TO-PRO-3. Both PA4 and PL2-3 BCR/TLR9 coengagement of WT B cells induced several rounds of division, followed by a synchronous postproliferative cell death (Fig. 2A, upper panels). In both cases, cells could be rescued by the addition of the B cell survival factor BLyS (Fig. 2A, lower panels). This extent of cell death was not observed in cells stimulated with either the TLR9 ligand CpG 1826 or the TLR7 ligand CL097 (Supplemental Fig. 1A), indicating that coengagement of the BCR and TLR9 resulted in a functional phenotype distinct from that elicited by TLR9 alone. Importantly, under the same conditions, BWR4-activated cells divided up to three times and remained viable, even in the absence of BLyS (Fig. 2A). RNA-containing ICs induce BLyS-independent survival. (A) CFSE-labeled RF WT B cells were stimulated with the indicated ligands in the absence (upper panels) or presence (lower panels) of 50 ng/ml BLyS for 72 h. Proliferation was measured by CFSE dilution, and cell death was measured by uptake of TO-PRO-3. The quadrants depict the following: upper left, dead divided cells (TO-PRO-3+ CFSE diluted); upper right, dead undivided cells (TOP-RO-3+ CFSE undiluted); lower right, live undivided cells (TO-PRO-3− CFSE undiluted); lower left, live divided (TO-PRO-3− CFSE diluted). Division numbers are indicated by red arrows underneath the flow plots. Flow plots are representative of >10 experiments. (B and C) B cells from RF WT, Tlr7−/−, Tlr9−/−, and Tlr7−/−Tlr9−/− mice were stimulated as in (A). Representative flow plots of B cells stimulated with PL2-3 (B) or with PA4, BWR4, and PL2-3 in the presence or absence of BLyS (C). Data represent the mean percentage (± SEM) of the recovered cells that had divided and remained alive (n = 9). (D) RF WT B cells were stimulated with PL2-3 in the presence or absence of BLyS, with or without a TLR9 inhibitor for 72 h. (E) RF WT B cells were stimulated with IgG2a IC that incorporated a defined CG-rich DNA fragment for 72 h. Flow plots in (D) and (E) are representative of three independent experiments. *p ≤ 0.05, **p ≤ 0.005, ***p ≤ 0.0005, two-way ANOVA and Bonferroni posttest. The same CFSE/TO-PRO criteria were used to monitor the 72-h response of Tlr7−/− and Tlr9−/− B cells. This analysis again showed that the PA4 response was entirely dependent on TLR9 for proliferation and on BLyS for survival, whereas the BWR4 response was TLR7 dependent and BLyS independent (Supplemental Fig. 1B). In contrast, Tlr7−/− and Tlr9−/−, but not Tlr7−/−Tlr9−/−, RF cells proliferated in response to PL2-3 (Fig. 2B). Moreover, in the absence of BLyS, Tlr9−/− cells responded better to PL2-3 than did either WT or Tlr7−/− cells (Fig. 2B, 2C). The effect of TLR9 deficiency could be recapitulated with a TLR9-specific inhibitor (Supplemental Fig. 1C); WT cells stimulated by PL2-3 in the presence of the inhibitor were less dependent on BLyS for survival (Fig. 2D). We also evaluated the response to defined ICs that incorporated a biotinylated CG-rich dsDNA fragment (18), bound by SA, and delivered to the RF BCR via an IgG2a anti-SA Ab. The response elicited by such an anti-SA/SA/Bio-DNA IC was entirely TLR9 dependent (Supplemental Fig. 1D) and recapitulated the postproliferative cell death/BLyS rescue observed for PA4- and PL2-3–activated RF B cells (Fig. 2E). Thus, TLR9 mediates a dominant proliferation/postproliferative cell death response; when the TLR9 component is eliminated, either genetically or by the use of an inhibitor, the cells that respond to PL2-3 through TLR7 maintain a more sustained response. To determine whether BCR/TLR9 and BCR/TLR7 engagement drive comparable programs of differentiation under conditions where both populations survive and divide, WT RF B cells were stimulated for 3 d with CpG 1826, CL097, PA4, BWR4, or PL2-3 in the presence of BLyS and then analyzed by flow cytometry for markers of B cell differentiation. Plasma cells (PCs) are defined by the surface expression of CD22lo, CD44hi, and CD138+ (26). Remarkably, only the BWR4-stimulated cells acquired the CD138 marker, indicative of differentiation toward the PC lineage (Fig. 3A). In contrast to these RNA ICs, cells stimulated with CL097 did not become CD138+ cells, again demonstrating the difference between ICs that bind both the BCR and TLR7 compared with small molecules that only engage TLR7. BCR/TLR7 coengagement promotes PC differentiation. (A) RF WT B cells were stimulated with the indicated ligands or monoclonal autoantibodies and stained for CD22, CD44, and CD138 to determine the frequency of CD22lo CD44hi CD138+ plasmablasts (n = 4). (B) RF WT, Tlr7−/−, Tlr9−/−, and Tlr7−/−Tlr9−/− B cells were activated with PL2-3 for 72 h and stained as in (A) (n = 4). (C) RF WT B cells were activated with PL2-3 in the presence of a TLR9-specific inhibitor for 72 h and stained as in (A) (n = 3). (D) Purified RF FcγR2b−/− B cells were activated with the indicated ICs for 96 h in the presence of 50 ng/ml BLyS. mRNA levels for bcl-6, Pax5, and prdm1 were determined by qPCR. Data were normalized to media control using the ΔΔCT method (n = 4). (E and F) Expression of B cell differentiation-associated genes in RF WT, Tlr7−/−, and Tlr9−/− cells after stimulation with PL2-3. Gene expression changes are reported as ratios relative to RF WT 0 h (unstimulated), as measured by gene expression arrays. *p ≤ 0.05, Student t test. Although these data point to a distinct functional outcome of BCR/TLR7-activated cells compared with BCR/TLR9-activated cells, under the conditions of this assay, PA4 and BWR4 both bind undefined endogenous autoantigens and, therefore, potentially could form ICs that differ in size, as well as content. Theoretically, such differences could impact the extent of BCR cross-linking and/or interactions with additional pattern recognition receptors. To address these concerns, we took advantage of the fact that PL2-3 activates B cells through both TLR9- and TLR7-dependent pathways and that the TLR9 component can be removed by using Tlr9−/− B cells, whereas the TLR7 component can be removed by using Tlr7−/− B cells. Other than TLR9 or TLR7, PL2-3 should engage the BCR and any other receptor to a comparable extent in all RF B cells. Therefore WT, Tlr7−/−, Tlr9−/−, and Tlr7−/−Tlr9−/− RF B cells were stimulated for 3 d with PL2-3 in the presence of BLyS. Importantly, and as expected, WT, Tlr7−/−, and Tlr9−/− B cells divided and survived comparably (Fig. 2C), but only PL2-3–activated Tlr9−/− B cells differentiated into CD138+ plasmablasts (Fig. 3A, 3B). CD138+ cells also were detected in cultures stimulated with PL2-3 in the presence of the TLR9 inhibitor (Fig. 3C). These data demonstrate that BCR/TLR7 engagement alone is more likely to promote cell survival and differentiation toward the PC lineage compared with BCR/TLR9 engagement alone. Furthermore, simultaneous BCR/TLR9 coengagement interferes with this process. To further verify the PC-skewed phenotype, RNA was isolated from WT B cells 4 d after BWR4, PA4, or PL2-3 activation and analyzed by qPCR for the expression of molecular markers of B cell differentiation. Consistent with the expression of CD138, BWR4-activated WT B cells expressed higher levels of Prdm1 and lower levels of bcl-6 and Pax5 (27) than did any of the populations activated by BCR/TLR9 engagement (Fig. 3D). Overall gene expression patterns were examined further by microarray analysis of PL2-3–activated WT and TLR-deficient cells. Overall, the gene expression profiles of WT and Tlr7−/− B cells were remarkably similar. Both populations only upregulated genes associated with PC differentiation at early time points, followed by downregulation of these genes at later time points (Fig. 3E). In contrast, Tlr9−/− B cells upregulated and maintained expression of the PC transcription factors Prdm1 and Irf4 (Fig. 3E) (28, 29). Moreover, expression of B cell transcription factors, such as Bcl6, Pou2f2, SpiB, and Ebf1, known targets of Prdm1, were repressed more strongly in Tlr9−/− cells at later time points (Fig. 3F) (30). Coordinately, PC-related markers like syndecan-1 (Sdc1, Cd138), Egr1, and Csf1 were expressed at higher levels in the absence of TLR9, whereas expression of typical B cell markers (MHCII, Cxcr5, and Cd20) was trending downward at 42 h (Fig. 3F) (30, 31). Finally, during PC differentiation, expression of BCR signaling components is lost, and cells redirect biosynthesis to increase the size and number of organelles like the endoplasmic reticulum, Golgi, and lysosomes to deal with the increased secretory load required for Ig secretion (30, 32). These changes are seen clearly in Tlr9−/− B cells, as reflected by a downward trend in the expression of BCR signaling components (Cd79a, Btk, Syk) (Fig. 3F) and increased expression of gene products required in the endoplasmic reticulum (Kdelr3, Uap1) and lysosomes (Lamp2) (Fig. 3E). Together, these data further support the idea that BCR/TLR7 coengagement in the absence of BCR/TLR9 coengagement favors differentiation of FO B cells toward the PC lineage. Recent studies showed that high concentrations of IRF4 result in preferential binding to IFN sequence motifs that are found in the promoter regions of genes associated with PC differentiation (33). Therefore, IRF4 protein levels were monitored by flow cytometry in WT and TLR-deficient RF B cells stimulated with PA4 or PL2-3 (Fig. 4A); IRF4 protein was upregulated in all activated populations at 24 h postactivation (gray line), but high levels of IRF4 protein were only sustained at 72 h in the PL2-3–activated Tlr9−/− cells (black line). A similar trend in mRNA levels at 42 h, as detected by microarray, confirmed the sustained expression of IRF4 in PL2-3–activated Tlr9−/− cells (Fig. 4B, left panel). BCR/TLR7-dependent activation leads to the prolonged expression of IRF4, and BCR/TLR9-dependent activation leads to early expression of IRF8. (A) RF WT, Tlr7−/−, Tlr9−/−, and Tlr7−/−Tlr9−/− B cells were stimulated with the indicated ligands for either 24 h (dotted line) or 72 h (black line), permeabilized, and stained for IRF4. The filled graph represents the isotype control. Representative plots of three independent experiments are shown. (B) RF WT, Tlr7−/−, or Tlr9−/− B cells were stimulated with PL2-3 for the indicated times, and gene expression for IRF4 (left panel) and IRF8 (right panel) was determined by microarray. (C) RF Tlr7−/− and Tlr9−/− B cells were stimulated with PL2-3 for 14 h (top panel) or 72 h (bottom panel) in the presence of 50 ng/ml BLyS. Expression of IRF8 (right panels) and IRF4 (left panels) was measured by flow cytometry (n = 2). The shaded histograms represent isotype controls. In addition to IRF4, the transcription factor IRF8 is important for B cell development and differentiation. However, IRF8 is upregulated in activated and germinal center B cells but is not required for PC differentiation (34). In contrast to IRF4, analysis of the microarray RNA expression levels revealed an early upregulation of IRF8 at 6 h in PL2-3–stimulated WT and Tlr7−/− cells (Fig. 4B, right panel) and less induction of IRF8 in Tlr9−/− cells. The RNA expression levels correlated with upregulation of IRF8 protein at 14 h in Tlr7−/− cells, as measured by flow cytometry (Fig. 4C). Together, the data suggest that the differentiation of BCR/TLR7-activated cells is determined by an IRF4-dependent regulatory network, whereas the differentiation of BCR/TLR9-activated cells is restrained by a counteracting IRF8 network early during activation. Notably, IRF8 protein levels were increased at 72 h after both BCR/TLR7 and BCR/TLR9 coengagement, which was indicative of delayed expression of IRF8 in the BCR/TLR7-activated cells. However, late expression of IRF8 did not seem to promote PC differentiation. Both TLR7 and TLR9 depend on Unc93b1 to acquire functional activity. The D34A mutant of Unc93b1 preferentially binds TLR7, and gene-targeted mice that express Unc93B1 D34A develop lethal systemic inflammation (35). These data point to a critical balance between Unc93B1 and its capacity to bind TLR7 and TLR9 in the regulation of TLR-dependent responses. To determine whether the unique functional activity of Tlr9−/− B cells, described above, simply reflected amplified TLR7 expression, we compared TLR7 protein levels in unstimulated and stimulated WT and Tlr9−/− RF B cells by flow cytometry. In the unstimulated B cells, TLR7 levels were low but comparable between WT and Tlr9−/− cells and were slightly higher than Tlr7−/− or unstained cells (Fig. 5A). Stimulation for 24 h with CL097 led to significantly increased, but again comparable, levels of TLR7 expression in WT and Tlr9−/− B cells. Stimulation with 1826 only led to increased expression of TLR7 in WT cells, because Tlr9−/− cells were not activated and Tlr7−/− cells did not express TLR7. Thus, it appears that, in both unstimulated and stimulated cells, WT and Tlr9−/− B cells express the same amount of TLR7. These expression levels are completely consistent with the overlapping dose-response curves of WT and Tlr9−/− RF B cells in response to increasing concentrations of CL097 (Fig. 5B). These values reflected relative mRNA levels, as determined by qPCR (data not shown). RF WT and Tlr9−/− B cells express comparable levels of TLR7. (A) Unactivated purified WT, Tlr7−/−, and Tlr9−/− RF B cells or B cells activated with the indicated ligands for 24 h were permeabilized and stained for TLR7 expression. Unstained cells are also shown. Representative plots of three experiments are shown (left panel). Data from the three experiments are summarized as MFI of the TLR7-staining intensities over background (right panel). (B) RF WT, Tlr7−/−, and Tlr9−/− splenic B cells were activated with the indicated concentrations of the synthetic TLR7 ligand CL097 for 30 h, and proliferation was measured by [3H]thymidine uptake. Data represent the mean ± SEM of eight independent experiments. It was important to determine whether the preferential survival and plasmablast differentiation of BCR/TLR7-activated B cells, which was apparent in vitro, extended to in vivo responses. To ensure that activation conditions were as comparable as possible, we again stimulated TLR-sufficient and -deficient RF B cells with PL2-3. WT, Tlr9−/−, Tlr7−/−, or Tlr7−/−Tlr9−/− RF B cells were labeled with VPD450 and injected i.v., together with 50 μg of PL2-3 or PBS, into BALB/c recipients. To accurately track the injected cells, CD45.2 RF B cells were injected into CD45.1 hosts. The mice were given a second injection of PL2-3 or PBS on day 3, and spleens were harvested on day 6. All genotypes engrafted comparably, because similar numbers of RF cells were recovered from the PBS-injected control groups (Fig. 6A, upper panels). RF Tlr7−/−Tlr9−/− B cells showed a minimal response, reiterating the critical role for BCR/TLR coengagement in the response to PL2-3 (Fig. 6A, lower panels, 6B). However, in contrast to the survival pattern observed in vitro whereby BCR/TLR9 activation induced postproliferative cell death, PL2-3–stimulated WT, Tlr9−/−, and Tlr7−/− B cells all divided multiple times (Fig. 6A lower panels, 6B), although Tlr7−/− cells underwent fewer divisions than did Tlr9−/− cells. There also was a trend toward fewer divisions in the WT group. The inability of BCR/TLR9 engagement to more effectively limit cell expansion of the transferred WT and Tlr7−/− cells most likely reflects rescue through steady-state or induced B cell survival factors. It is difficult to determine whether constitutive levels of BLyS are sufficient to maintain the survival of these cells because it is known that PL2-3 IC activation of host DCs and neutrophils promotes the further production of BLyS (36, 37). BCR/TLR7 activation promotes AFC differentiation in vivo. (A) BALB/c CD45.1 recipients were injected i.v. with 15 × 106 WT, Tlr7−/−, Tlr9−/−, or Tlr7−/−Tlr9−/− VPD450-labeled RF B cells and 50 μg PL2-3 on day 0; they were injected again with PL2-3 on day 3. Spleens were harvested on day 6. B cell engraftment was ascertained by CD45.2 staining, and proliferation was measured by dilution of VPD450. Representative plots of three independent experiments are shown. (B) The mean (± SEM) number of cell divisions based on the data in (A) was calculated for each mouse (n = 3 mice/group). *p ≤ 0.05, Student t test. (C) BALB/c CD45.1 recipients were injected with AM14 B cells, as above, but were injected with PL2-3 on days 0, 3, 7, and 10. Additional BALB/c CD45.1 mice were injected only with PL2-3 and not RF B cells (none). Spleens were harvested on day 13; the number of clonotype-positive IgG+ AFCs was measured by ELISPOT. Data are compiled from four independent experiments. **p ≤ 0.005, ***p ≤ 0.0005, one-way ANOVA including the Tukey multiple-comparison test. To assess the role of TLR7 and TLR9 in PL2-3–induced PC differentiation, CD45.1 BALB/c mice were injected with RF B cells and PL2-3 and then given additional injections of PL2-3 on days 3, 7, and 10. On day 13, the total number of RF B cells in the spleen was determined by flow cytometry, and the number of IgG1 and IgG2a AFCs was determined by a clonotype-specific ELISPOT assay. At this time point, we recovered comparable numbers of RF WT and Tlr7−/− B cells, approximately twice as many RF Tlr9−/− B cells, and very few RF Tlr7−/−Tlr9−/− B cells (data not shown). These data are consistent with the day-6 results and further support the premise that TLR9 expression limits expansion of autoreactive B cells. Importantly, Tlr9−/− B cell–injected mice had almost 10-fold more IgG AFCs than did Tlr7−/− B cell–injected mice, consistent with the propensity of the in vitro–activated Tlr9−/− cells to acquire PC markers (Fig. 6C). The mice injected with WT cells also had more AFCs (2.5 fold) than did Tlr7−/−-injected mice, as might be predicted by greater division. These data demonstrate that BCR/TLR7 B cell activation, in the absence of BCR/TLR9, preferentially induces autoreactive B cells to differentiate into isotype-switched AFCs compared with BCR/TLR9-activated cells, as well as promoting improved survival. The analysis of TLR9-deficient murine models of systemic erythematosus lupus (SLE) has given paradoxical results. Although these mice fail to make autoantibodies reactive with dsDNA, as determined by the immunofluorescent staining of mitotic plates in anti-nuclear Ab assays, they invariably develop more severe SLE that is associated with a decreased lifespan (2, 6, 38, 39). B cells were shown to play a critical role in SLE, both through the production of autoantibodies that form pathogenic ICs and through their capacity to activate autoreactive B cells. A previous study found that Tlr9−/− B cells obtained from 2-mo-old autoimmune-prone Nba2 Yaa mice expressed higher levels of TLR7 mRNA and responded better to the TLR7 ligand imiquimod than did B cells obtained from age-matched TLR-sufficient Nba2 Yaa mice (8). However, these Tlr9−/− Nba2 Yaa mice develop a hyperaccelerated autoimmune disease, and survival is already compromised by 3 mo of age. Therefore, it is difficult to determine whether the enhanced TLR7 response of Tlr9−/− Nba2 Yaa B cells reported in this study was due to the loss of TLR9 expression per se or to the fact that these B cells had already been activated in vivo by the autoimmune disease process, because we now document upregulation of TLR7 protein levels in response to TLR activation. In a separate report, purified B cells obtained from Tlr9−/− and WT nonautoimmune-prone C57BL/6 mice were compared and shown to produce comparable amounts of cytokine in response to the TLR7 ligand R848 (40). We now show that purified B cells from nonautoimmune-prone mice responded comparably to increasing concentrations of a TLR7 ligand and that both unstimulated and stimulated WT and Tlr9−/− B cells expressed comparable levels of TLR7, as detected by flow cytometry with a TLR7-specific Ab (Fig. 5). Therefore, TLR9 deficiency in B cells does not seem to impact the TLR7 signaling threshold. Nevertheless, as shown in the current study, BCR/TLR7 activation and BCR/TLR9 activation can lead to distinct functional outcomes, especially with regard to autoantibody production. We found that isolated in vitro–activated BCR/TLR7-activated Tlr9−/− B cells are more likely to differentiate toward the PC lineage than are BCR/TLR9-activated Tlr7−/− B cells and that the BCR/TLR7-activated Tlr9−/− B cells preferentially give rise to IgG autoantibody–producing cells in vivo. Moreover, BCR/TLR9 activation can at least partially block the BCR/TLR7-driven response. Consistent with the studies of nontransgenic B cells (M.A. Oropallo, V.J. Sindhava, K. Moody, L. Zhou, N. Green, K. Nündel, W. Stohl, A.M. Schmidt, C.A. Lowell, C. Lamagna, T. Kambayashi, A. Marshak-Rothstein, and M.P. Cancro, submitted for publication), BCR/TLR9 coengagement in vitro induced postproliferative cell death, even in cells coactivated by BCR and TLR7. Only Tlr9−/− RF B cells could sustain an extended BLyS-independent response to PL2-3, an autoantibody that binds both DNA- and RNA-associated ligands. The addition of BLyS to the in vitro–activated TLR9-sufficient WT RF B cells prevented postproliferative cell death; however, these cells still did not show the same capacity to differentiate toward the PC lineage as did Tlr9−/− RF B cells. The capacity of TLR9 to constrain the survival of PL2-3–activated RF WT cells in vivo was less apparent, perhaps due to either basal levels of BLyS or to PL2-3 IC activation of plasmacytoid DCs (or other TLR-sufficient APCs that express FcγRs) and the ensuing production of prosurvival factors. This is a limitation of the use of PL2-3 ICs. In the context of a (nontransgenic) polyclonal repertoire, DNA-reactive (or other autoreactive) B cells would be exposed to DNA-associated autoantigens directly, prior to the production of ICs that could engage FcγR+ cells. In fact, in a steady-state, MRL.Faslpr Tlr9−/− 3H9λ1+ DNA-reactive B cells were shown to have a longer half-life in vivo than MRL.Faslpr Tlr9+/+ 3H9λ1+ DNA-reactive B cells (41), consistent with the premise that the lifespan of naive B cells responding to DNA-associated autoantigens is curtailed through a TLR9-dependent mechanism. However, once RNA-associated ICs are present in the circulation and are able to elicit the production of survival factors, BCR/TLR9 coengagement of DNA- or chromatin-reactive cells may no longer lead to cell death but, rather, activation. It was somewhat surprising to find that the small molecule ligands 1826 and CL097 did not induce CD138 expression, because other investigators found that TLR ligands can drive B cells to become CD138+ (42–44). Most of these studies used a mixed population of FO and marginal zone (MZ) B cells. As we reported previously (15), BALB/c AM14 side-directed transgenic mice lack B1, MZ, and MZ precursor B cell compartments; therefore, our studies were carried out on a highly enriched population of naive FO B cells. These RF B cells express very low levels of TLR7 prior to activation and may not completely recapitulate the response of a polyclonal population. However, our data are consistent with the findings of Genestier et al. (45), who reported that TLR ligation predominantly induces MZ B cells and B1 B cells to differentiate into CD138+ plasmablasts and AFCs. BCR/TLR9 engagement of nontransgenic polyclonal B cells also preferentially induces MZ B cells to differentiate into AFCs (M. A. Oropallo et al., submitted for publication). The association between BCR/TLR9 activation and early upregulation of IRF8 is consistent with the phenotype of Irf8−/− mice. B cell–conditional Irf8−/− mice have twice the number of mature B cells, as well as greater numbers of MZ and B1 cells (34). In addition, they spontaneously produce anti-dsDNA autoantibodies by 3 mo of age (46). Also, in contrast to MD4 × sHEL mice, Irf8−/− × MD4 × sHEL B cells differentiate to a more mature phenotype and spontaneously produce anti-HEL Abs (46). Together, the data point to a major role for IRF8 in the maintenance of B cell tolerance; therefore, IRF8 expression by PL2-3–activated B cells may account, in part, for the negative regulatory role of TLR9. An interesting comparison can be made between our in vivo experiments and a previous report that involved the day-7 in vivo PL2-3 response of autoimmune-prone MRL.Faslpr AM14 B cells (26). Although this study found that TLR-sufficient mice appeared to have more AFCs than did Tlr7−/− or Tlr9−/− mice, as detected by the number of ELISPOT+ cells, Tlr9−/− mice had a higher percentage of plasmablasts than did Tlr7−/− or WT mice, as determined by the phenotype CD22lo CD138+. In contrast, in the current study, the number of IgG+ AFCs produced by WT B cells at day 13 was significantly lower than the number produced by Tlr9−/− B cells. The MRL/lpr study may be somewhat confounded by the accelerated disease in Tlr9−/− MRL/lpr mice, as well as subsequent changes in total spleen cell number and cell subset distribution. Nevertheless, the data suggest that the CD138+ cells are not full-fledged AFCs but rather are a distinct subset that is preferentially generated by BCR/TLR7 engagement, but only in the absence of BCR/TLR9 engagement. Additional studies will be necessary to further elucidate the direct impact of TLR7 and TLR9 on the long-term survival of RF B cells, as well as their capacity to move into specific short-lived and long-lived PC compartments. Several laboratories have produced 80% μMT (or JhD−/−) + 20% Tlr9−/− mixed chimeras, in which TLR9 deficiency is predominantly limited to the B cell lineage (9, 41, 47). These B cell Tlr9−/− mice invariably develop more severe clinical features, including higher autoantibody titers, more extensive isotype switching of the autoantibody-producing cells, and increased activation of potentially autoreactive T cells. However, the potential contribution of other TLR9-expressing cell types cannot be completely ruled out because a significant proportion (20%) of the myeloid lineage also could be TLR9 deficient. Nevertheless, the 80% μMT + 20% Tlr9−/− chimeric mice invariably developed greater numbers of autoantibody-producing PCs, as well as effector/memory T cells, more extensive ectopic follicles, and more severe renal disease (9), consistent with the notion that Tlr9−/− B cells are more likely to differentiate into autoantibody-producing plasmablasts and more effectively activate autoreactive T cells. Exacerbated disease in these chimeras also could be attributed to the absence of TLR9-expressing cells that make protective Abs required for the clearance of apoptotic debris (47) or to cytokines produced by residual Tlr9−/− myeloid cells. The current study clearly shows that BCR/TLR9 and BCR/TLR7 coengagement lead to distinct functional phenotypes. 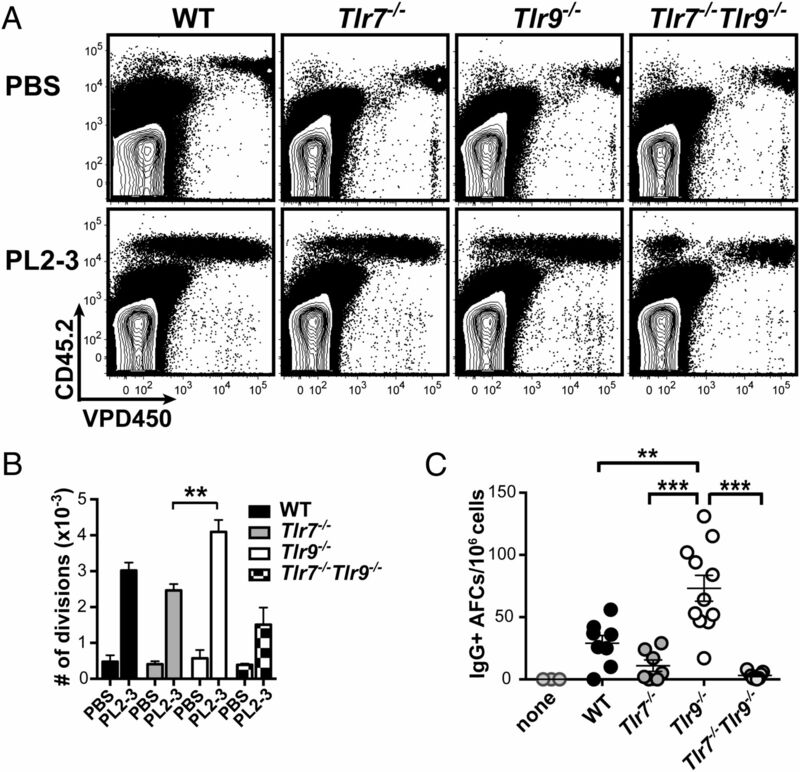 Our findings are strengthened by a recent publication that documents opposing roles for TLR7 and TLR9 in the formation of spontaneous germinal centers (48). Overall, the data point to a unique B cell–intrinsic role for TLR9 in the constraint of autoantibody production. Intriguingly, TLR8 was reported to negatively regulate murine SLE (40). These effects may reflect increased activity of TLR7, as a result of improved access to Unc93b (49) or, alternatively, distinct downstream components of the relevant TLR signaling cascades. These possibilities will be addressed in upcoming studies. It also will be important to determine whether TLR9 plays a similar role in the regulation of human autoimmunity, because a better understanding of the regulatory activity of the individual TLRs is likely to have implications for the optimal design of TLR-based therapeutics. We thank Drs. Harinder Singh and Mark Shlomchik for helpful discussions. Furthermore, we thank Tara Robidoux and Purvi Mande for technical help. This work was supported by National Institute of Arthritis and Musculoskeletal and Skin Diseases/National Institutes of Health (NIH) Grant AR050256 (to A.M.-R.) and Department of the Army Grant PR120610 (to M.P.C.). M.A.O. was supported in part by NIH Training Grant T32 AI-055428, and A.L.S. was supported by the NIH intramural program. The gene expression data presented in this article have been submitted to the National Center for Biotechnology Information Gene Expression Omnibus database under accession number GSE58756. The contents are solely the responsibility of the authors and do not necessarily represent the official views of the National Institute of Arthritis and Musculoskeletal and Skin Diseases or the National Institutes of Health.
. 2002. Chromatin-IgG complexes activate B cells by dual engagement of IgM and Toll-like receptors. Nature 416: 603–607.
. 2006. Autoreactive B cell responses to RNA-related antigens due to TLR7 gene duplication. Science 312: 1669–1672.
. 2006. A Tlr7 translocation accelerates systemic autoimmunity in murine lupus. Proc. Natl. Acad. Sci. USA 103: 9970–9975.
. 2006. Role of TLR9 in anti-nucleosome and anti-DNA antibody production in lpr mutation-induced murine lupus. J. Immunol. 177: 1349–1354.
. 2010. TLR9 regulates TLR7- and MyD88-dependent autoantibody production and disease in a murine model of lupus. J. Immunol. 184: 1840–1848.
. 2006. Toll-like receptor 9-independent aggravation of glomerulonephritis in a novel model of SLE. Int. Immunol. 18: 1211–1219.
. 2010. Critical role of TLR7 in the acceleration of systemic lupus erythematosus in TLR9-deficient mice. J. Autoimmun. 34: 339–348.
. 2014. Opposing impact of B cell-intrinsic TLR7 and TLR9 signals on autoantibody repertoire and systemic inflammation. J. Immunol. 192: 4525–4532.
. 2013. Signals via the adaptor MyD88 in B cells and DCs make distinct and synergistic contributions to immune activation and tissue damage in lupus. Immunity 38: 528–540.
. 1993. A rheumatoid factor transgenic mouse model of autoantibody regulation. Int. Immunol. 5: 1329–1341.
. 2010. A new site-directed transgenic rheumatoid factor mouse model demonstrates extrafollicular class switch and plasmablast formation. Autoimmunity 43: 607–618.
. 1988. Oligoclonality of rheumatoid factors arising spontaneously in lpr/lpr mice. Clin. Immunol. Immunopathol. 46: 382–395.
. 2013. The role of Bruton’s tyrosine kinase in the development and BCR/TLR-dependent activation of AM14 rheumatoid factor B cells. J. Leukoc. Biol. 94: 865–875.
. 2005. RNA-associated autoantigens activate B cells by combined B cell antigen receptor/Toll-like receptor 7 engagement. J. Exp. Med. 202: 1171–1177.
. 2008. Autoreactive B cells discriminate CpG-rich and CpG-poor DNA and this response is modulated by IFN-alpha. J. Immunol. 181: 5875–5884.
. 2009. Murine B cell response to TLR7 ligands depends on an IFN-beta feedback loop. J. Immunol. 183: 1569–1576.
. 1996. Specificities and genetic characteristics of nucleosome-reactive antibodies from autoimmune mice. Mol. Immunol. 33: 89–99.
. 1994. D-penicillamine- and quinidine-induced antinuclear antibodies in A.SW (H-2s) mice: similarities with autoantibodies in spontaneous and heavy metal-induced autoimmunity. Eur. J. Immunol. 24: 723–730.
. 1991. Recurrent utilization of genetic elements in V regions of antinucleic acid antibodies from autoimmune mice. J. Immunol. 147: 361–368.
. 2009. DNA-like class R inhibitory oligonucleotides (INH-ODNs) preferentially block autoantigen-induced B-cell and dendritic cell activation in vitro and autoantibody production in lupus-prone MRL-Fas(lpr/lpr) mice in vivo. Arthritis Res. Ther. 11: R79.
. 2013. Essential role for Toll-like receptor 7 (TLR7)-unique cysteines in an intramolecular disulfide bond, proteolytic cleavage and RNA sensing. Int. Immunol. 25: 413–422.
. 2008. T cell-independent and toll-like receptor-dependent antigen-driven activation of autoreactive B cells. Immunity 29: 249–260.
. 2003. Regulatory mechanisms that determine the development and function of plasma cells. Annu. Rev. Immunol. 21: 205–230.
. 2006. Graded expression of interferon regulatory factor-4 coordinates isotype switching with plasma cell differentiation. Immunity 25: 225–236.
. 2002. Blimp-1 orchestrates plasma cell differentiation by extinguishing the mature B cell gene expression program. Immunity 17: 51–62. 2003. Gene expression profiling of plasma cells and plasmablasts: toward a better understanding of the late stages of B-cell differentiation. Blood 102: 592–600.
. 2013. 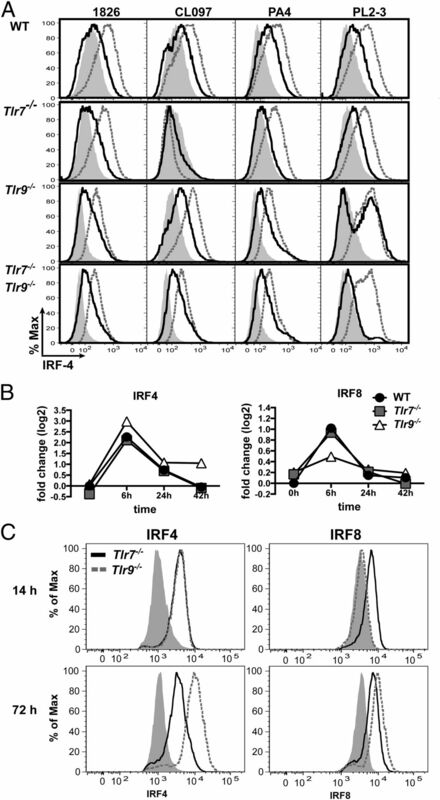 Transcriptional regulation of germinal center B and plasma cell fates by dynamical control of IRF4. Immunity 38: 918–929.
. 2011. Unc93B1 restricts systemic lethal inflammation by orchestrating Toll-like receptor 7 and 9 trafficking. Immunity 35: 69–81.
. 2004. Toll-like receptor 9-dependent and -independent dendritic cell activation by chromatin-immunoglobulin G complexes. J. Exp. Med. 199: 1631–1640.
. 2005. Proinflammatory mediators elicit secretion of the intracellular B-lymphocyte stimulator pool (BLyS) that is stored in activated neutrophils: implications for inflammatory diseases. Blood 105: 830–837.
. 2005. Toll-like receptor 9 controls anti-DNA autoantibody production in murine lupus. J. Exp. Med. 202: 321–331.
. 2013. Exacerbated autoimmunity in the absence of TLR9 in MRL.Fas(lpr) mice depends on Ifnar1. J. Immunol. 190: 3889–3894.
. 2014. TLR8 on dendritic cells and TLR9 on B cells restrain TLR7-mediated spontaneous autoimmunity in C57BL/6 mice. Proc. Natl. Acad. Sci. USA 111: 1497–1502.
. 2013. TLR9 promotes tolerance by restricting survival of anergic anti-DNA B cells, yet is also required for their activation. J. Immunol. 190: 1447–1456.
. 2006. ERK signaling is a molecular switch integrating opposing inputs from B cell receptor and T cell cytokines to control TLR4-driven plasma cell differentiation. J. Immunol. 177: 5337–5346.
. 2003. Resistance to CpG DNA-induced autoimmunity through tolerogenic B cell antigen receptor ERK signaling. Nat. Immunol. 4: 594–600.
. 2011. Toll-like receptor agonists synergize with CD40L to induce either proliferation or plasma cell differentiation of mouse B cells. PLoS ONE 6: e25542.
. 2007. TLR agonists selectively promote terminal plasma cell differentiation of B cell subsets specialized in thymus-independent responses. J. Immunol. 178: 7779–7786.
. 2013. A role for IRF8 in B cell anergy. J. Immunol. 191: 6222–6230.
. 2011. TLR9 in peritoneal B-1b cells is essential for production of protective self-reactive IgM to control Th17 cells and severe autoimmunity. J. Immunol. 187: 2953–2965.
. 2014. B cell-intrinsic TLR7 signaling is essential for the development of spontaneous germinal centers. J. Immunol. 193: 4400–4414.
. 2009. Unc93B1 biases Toll-like receptor responses to nucleic acid in dendritic cells toward DNA- but against RNA-sensing. J. Exp. Med. 206: 1339–1350.